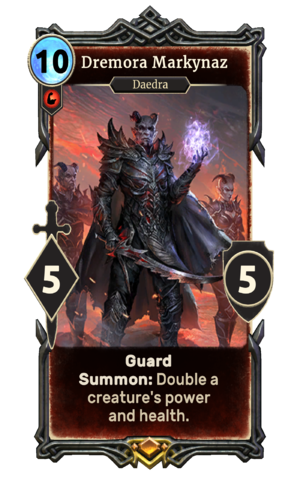 Dremora Markynaz is a legendary Strength creature card. It is part of the Core Set. "I admire the hatred in your heart." This card's summon ability applies the Might of Oblivion card effect. Markynaz was the name of a class of Dremora that appeared in Oblivion and Skyrim. This card was named Fist of Oblivion in the game files. This page was last modified on 14 February 2019, at 23:24.